This lab utilizes the computer program, Excel. 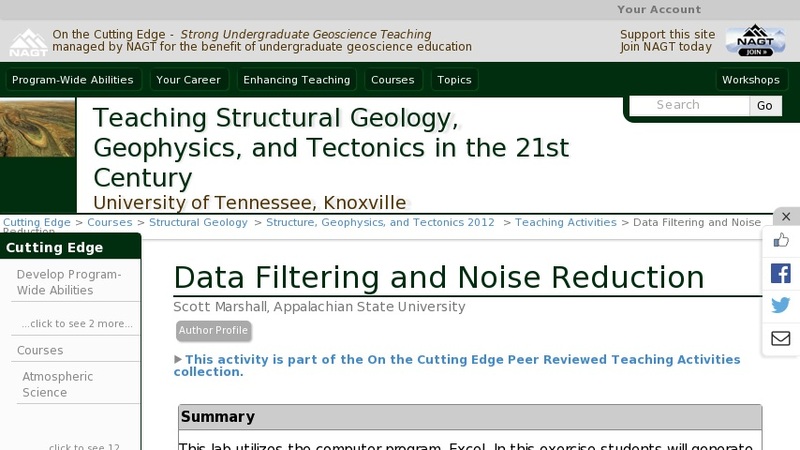 In this exercise students will generate synthetic data sets based on a simplified model of daily high temperatures in Boone, NC and apply several filtering techniques to the data. A key to this lab is that the students must use Excel in an efficient manner; otherwise, this exercise may take a long time to complete. Thus, the synthetic data sets are intentionally large in size. The overarching purpose of this lab is two-fold: 1) Perform some quantitative data processing and determine the effectiveness of several types of simple mathematical noise filters, and 2) Make a professional interpretation and recommendation based on quantitative results.